Creating a website, logo or brand identity can take up hours, or even days or weeks – especially for non-designers. As a freelancer, corporate or early-stage entrepreneur, you may find yourself struggling with copy that speaks directly to your clients, picking colours that match your mission or coming up with a logo that encapsulates your brand. Even if you’ve already made a decision, how can you be sure that you’ve built a design that allows for flexibility in the future? How do you know that your choice reflects solid research and market-tested results? At Startup2Life.com, it’s no secret that we value branding so much that it’s included in the modules of our flagship 6Weeks2Startup online course. One of our important exercises is to come up with a logo for your ideal business, either by yourself or with a pro. If you’re a freelancer, corporate or early-stage entrepreneur looking to build your brand in the most efficient and cost-effective way, where do you start? 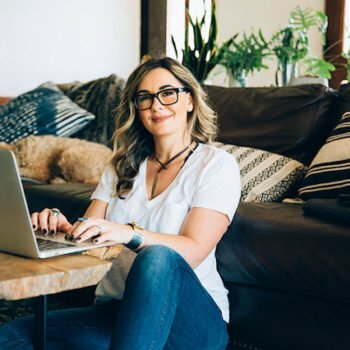 To get expert advice, our founder Anna C. Mallon sat down with Chassie Bell, the designer extraordinaire of Startup2life.com. If there’s anyone in the design world that we’re most excited to interview, it’s Chassie. She’s a brand specialist, passionate home cook, former yearbook nerd, novice homesteader and wife and mom to two dogs. She is not only a talented and successful graphic designer but has years of experience working with entrepreneurs of all stages. Like most of us, Chassie’s career path wasn’t a straight one. Just a few years ago, she decided to work full-time as a nutritionist to leave her job as a corporate graphic designer. Then to her surprise, “I was getting more clients asking about my design and branding than actual work as a nutritionist!” Even though it was a tough decision to leave the world of nutrition and holistic wellness that she loved, the market demanded her creative work. Asked about how she finds work-life balance, Chassie shared a piece of wisdom from Danielle Laporte’s book, The Desire Map. “When I started my career, I made decisions based on what made me money and it was an exhausting, stressful place. With Danielle’s book, I learned my core desired feelings are fun, joy, ease and freedom.” With this fresh new mindset came a snowball of positive results – Chassie learned to say no to opportunities that don’t align with her intentions, set boundaries for herself and attract project that was truly meaningful to her. “It shifted how I approach my business,” she added. "A terrific read on building a brand for any small business owner! Loved the #design #logo resources"